The first post in this topic is in regards to timing of death and short life lines. I think it's important to recognize that short life lines may be sitting right next to a crease that counts as an extension of the life line. 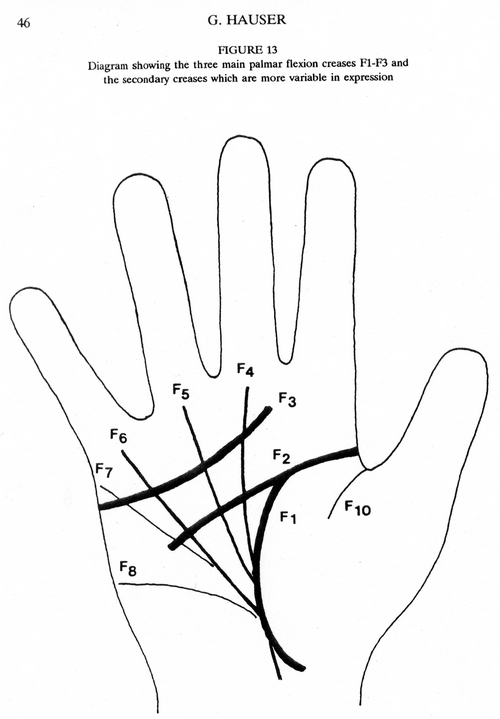 In addition to what I wrote yesterday, I would like to add this from "Dermatoglyphics in Medical Disorders"
"The thenar crease is the consequence of oppositional function of the thumb and thenar muscle pad; the distal transverse creases follows the underlying sloping alignment of the 3rd to 5th metacarpal-phalangeal joints; the proximal transvervse crease is influencd on its radial aspect by the flexion of the second-metacarpal-phalangeal joint." "The radial longitudinal crease, commonly called the thenar, thumb, or vertical crease, is the curved crease encircling the thenar eminence and ending at the radial side of the hand somewhat above the distal wrist crease. It is the deepest crease in this area when the thumb is opposed." "In individuals with an absent, rudimentary, or hypoplastic functionless thumb, the thenar crease is missing. Hypoplastic thumbs with limited function are associated with poorly developed thenar creases. An altered position of the thumb results in a thenar crease that is similarly altered in position. For example, a proximally placed thumb is accompanied by a proximally placed thenar crease." Martijn, you have not mentioned that your aunt had an abnormally developed thumb. I'm assuming she did not. I'm also pretty sure from the print that when she moved her thumb toward her fingers, the crease surrounding the thenar mount is the crease that deepens as described above. When you remove the colors from the lines you can see they are all fairly thin with only a few patches of wider and deeper creases. There is a natural tendency for the major creases to break and come together in sections. Note the break in the heart line circled in green. Here you can see the breaks in the conjoined head and life line and the Mars line below. A lower Mars line(?) is barely visible now. Actually, I now think that Martijn may have traced an influence line and mis-labeled it a Mars line. The so-called short life line is the Mars line after all. I'll share another confirming example in the next post. Patti, my aunt indeed does not have an abnormal thumb (it's well developed and slightly long but close to normal). PS. Sorry, I do not recognize the significance of your speculation about the line which I described as a mars line - but I think it perfectly fits in the normal descriptions for a mars line (so I am wondering about the purpose you have in mind - since we appear to agree about the nature of the line which I have described as the life line??? ). The above image is from page 171 of "Applied Handreading" by Arnold Holtzman. In the preceeding pages he discusses the life line in regards to the crease not fully enclosing the thenar eminence and mentions the missing life line in his examples. He also included the above example and referred to it under the heading entitled "The Line of Life as an extension from the line of Ego Reaction (the line of Head)"
He says "Very often one finds a line of Life which originates from a point well along the line of Head." 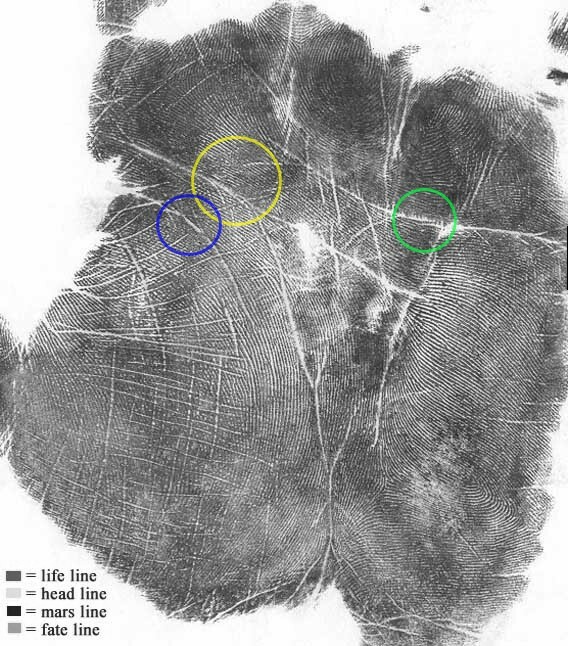 Although the texture and type of ridges and creases are different in this example from Martijn's aunt, the short inner life lines are present along with a single longitudinal crease attached to the head line with the fate line branches shooting upward from it. The description is the same. It is obvious from the text that Holtzman has no hesitation in calling this crease that surrounds the thenar mount a life line and he makes no reference to the short inner lines. Patti, your comment reminds me about the order in which the heart line develops (which typically starts manifesting as two different crease that later connect - and one can see traces of this process in many adult heart lines indeed). However, I am not aware that a likewise process is seen in other (major) creases. So I am wondering: are you aware of any reports that support your description above (for the tendency to display a 'break' in the other creases)? Further research and removing the colors has led me to disagree with your choice of Mars lines. The upper one is an inner life line or Mars line. The lower one looks more like an influence line. I would keep the aqua colors the same and see the short inner life line/Mars line as only a section of the life line that continues from the connection with the head line. Like Holtzman's example. It's an obvious observation of your aunt's print that her major lines break and overlap. Unfortunately I cannot compare to her other hand as you haven't been able to honor my repeated request to see her right left hand. tajender wrote: Nice description Patti. Martijn simply tries to show other writer's in wrong way. Except Johny and 2d:4d ratio (do not recall the name of the author), all other writers are not qualified authors. Thats what I understand from his comments here. His depiction of fate line in this particular case shows how he is trying to mislead others. Tajender, I don't think Martijn has any intentions to mislead others. He has his own viewpoints and can be stubbornly fixed at times in his position but I do not think his underlying intentions involve misleading others. Here in this discussion I'm looking forward to seeing if he can offer more than his opinion to support his statement that his aunt has only a single short life line in her right hand. Patti, Holtzman's example is much more complex than what his description suggests. - Then I could argue for Holtzman's example that the life line appears to start at a rather unusual location: because it appears to start above the head line inside the mount of jupiter (see the short line above the mars line). So, both the head line and the life line appear to start at a relatively high position (though one could also argue that it is just the rather large mount of mars which creates this suggestion). - However, there is another important aspecti: because one could argue in this example that both the short life line and the heart line get fused with the head line. And due to this 'fusion' of three lines... one can no longer actually discriminate those lines. Now, looking a the characteristics of the razor strait line starting at the wrist and directing to the zone below the middle finger (actually... I think it goes through), I think it shows all typical characteristics of a typical fate line. So, I think... since Holtzman did not talk about the 'short life line' at all, I think his description is actually kind of confusing (because he also must have ignored the fact the the fate line does appear to progress through the head line... and even the small change of the path towards the ring finger is a very common tendency in fate lines!). I also would see the short rising line toward the index finger in Holtzman's example as the early portion of the life line and the rest of the life line as extending downward from the head line. This is similar to your aunts, only her short line doesn't rise upwards. The heart line is not relevant to this discussion. What is most important is the description by Schaumann & Alter which is in agreement with my palmistry experience, and seemed to be what Lynn was also describing, we look for a continuous connection/overlapping of lines enclosing the thenar mount. "The radial longitudinal crease, commonly called the thenar, thumb, or vertical crease, is the curved crease encircling the thenar eminence and ending at the radial side of the hand somewhat above the distal wrist crease. . It is the deepest crease in this area when the thumb is opposed"
Patti, thank you for correcting Tajender regarding his false suggestions. But it is a bit disappointing for me to see you taking this topic to a personal level by suggesting that I have shared only an 'opinion' - and to see you suggesting that I am kind of only trying 'stubbornly' to hold on that opinion (while by fact I have shared quite a few observations to support my assessment + I have made some references to the Korean approach regarding how to assess major palmar creases by detail). And meanwhile... I notice that you have not shared your ideas at all about whether you think that the length of the life line can reveal anything about the length of life - as suggested by Cheiro's theories! Would you please mind to make a statement about your ideas regarding Cheiro's theory that the length of life line reflects the length of life (which concerns the original subject raised by Tajender in his first post of this topic). But it is quite disappointing for me to see you taking this topic to a personal level by suggesting that I have shared only an opinion - and by suggesting that I am kind of only trying 'stubbornly' to hold on that opinion (while by fact I have shared quite a few observations to support my assessment + I have made some references to the Korean approach regarding how to assess major palmar creases by detail). Parkash started this thread without mention of Cheiro anywhere that I can see. In order to accurately time the life line, one needs to be aware of the true boundaries and multiple formations of the life line. I haven't seriously studied or read Cheiro's theory and cannot comment to that. Would you please mind to make a statement about your ideas regarding the theory that the length of life line reflects the length of life (which concerns the original subject raised by Tajender in his first post of this topic). I'll take it that you agree that your aunt has a long life line after all according to the description of Schaumann & Alter, and of Holtzman, and the question in regards to outliving a short life life is not relevant to her hand. Here is another interesting example of a short life line appearing inside a longer life line. 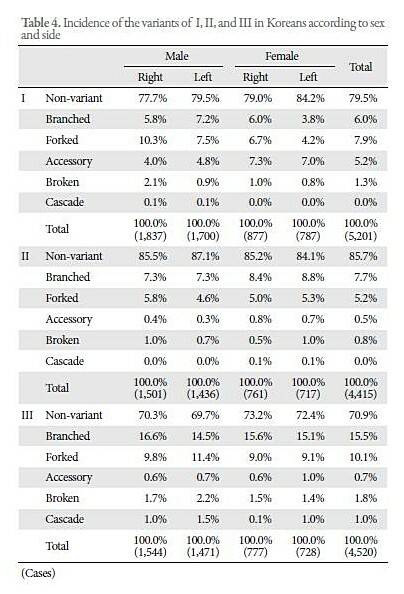 Interestingly in this example neither are anchored in the head line. I realize this sample has unusual head line and heart line creases as well as a separate fate line. The point of sharing this is the short life line inside a longer life line. The parallel overlapping lines are described together. if we read both persons hand then we can recognized that the life line is tied the length of life coz both person's have short life line and both have died at earlier or mid as their life line told..........? I have read several people who died after I read their hands. One person died that evening on the way home from the party where I was reading hands. I remember talking about her fate line breaking and rising up closer to the index finger. She had just gotten a big promotion within her company and was moving up in her world. Nothing I could tell or recall indicated an abrupt ending to her life. Her car slid on ice going around a bend near her home and she hit a tree and was killed instantly. It was on the front page of the newspaper the next morning. I have read several people with terminal cancer and aids, that have passed away, being ill showed on their lines, but there was more life line left after the point they died. I recall one case about twenty years ago where a young woman, happily married with little children to raise. She had conquered breast twice before and it had returned again. This time she had been told it was untreatable because of it's location and the extent it had spread. She looked healthy enough, but the odd thing about her life lines were that they became clear, strong and unmarked as they continued down and around her thumb around the same time period as the age she was at the time. I don't know the outcome, I recall telling her that she had strong and healthy features, but she seemed to have already accepted the outcome the doctors had told her. I think the length and quality of the life line reflects our physical constitution and how we use our energy and there is no way to read the end of a person's life by the length of the line. I have seen senior citizens in nursing homes who have long outlived their life lines and as mentioned above a number of people who died with plenty of life line left beyond their exit point. Before determining if a person has a short life line, it is important to understand the relationship between the life line and the head line as well as the relationship between the life line and the fate line. Patti wrote: I also would see the short rising line toward the index finger in Holtzman's example as the early portion of the life line and the rest of the life line as extending downward from the head line. This is similar to your aunts, only her short line doesn't rise upwards. The heart line is not relevant to this discussion. Sorry Patti, I can not support this observation at all... since by fact: you are talking about an aspect that you can not 'read' from a hand print! By the way, Schaumann & Alter's rather general description for the life line might not be very helpful to decide whether the 3th part of the fate line can be described as belonging to the life line... because they have not talked about how the lines will respond in cases where the life line is short (or irregular, etc.). Because we can not 'read' from the print how the lines would respond when the thumb is moved inwards! Additionally, the fact that the upper third part of the fate line is manifesting in the print as a wider line than the width of the short life line... does not exclude the possibility that the more inward positioned short life line might actually appear much more deeper than what maby be suggested by the width in the print. Simply because that short life line is positioned much closer to the thumb - which FOR SURE raises the chances that the short life line will appear 'deeper' than the fate line! Bali and Chaube point out the various starting points of the life, fate and ulnar creases in terms of their association with each other. I quoted from them as well. They support Schaumann & Alter very well. Your aunt has a single carpal based crease according to their work. I think that to a pretty good extent, an experienced hand analyst can tell which creases deepen when the hand, fingers and thumb are flexed and bent in various positions. Patti wrote: I'll take it that you agree that your aunt has a long life line after all according to the description of Schaumann & Alter, and of Holtzman, and the question in regards to outliving a short life life is not relevant to her hand. Patti, I have just described why Schaumann & Alter's guideline (regarding using the opposing thumb) is not helpful at all to take position in this matter. And I already described that I also question whether Holtzman's example can serve here as a leading guideline (for multiple reasons)... so it's a bit surprising to see how you took my understanding for the fact that we are talking about an 'arbitrary issue', as a confirmation for your assessment that the 3th part of the fate line represents the life line. Sorry, I am still at the position that my aunt only has a short life line. (I only acknowledged that there is indeed an arbitrary element in her hand which leaves some space to question my position... but I have not yet seen a solid argument/observation which could provide support for your position - where you appear to take at least the upper part of the fate line as representing another part of the life line). I hope my position in now more clear? Because their approach is not designed for assessing the 'nature' of individual creases involved. For example: the single true II variant in figure 9.28 shows that this approach even counts 2 crossing creases as just one single carpal base crease... which is a clear indication that this carpal-approach likely can not become helpful in our discussion here. 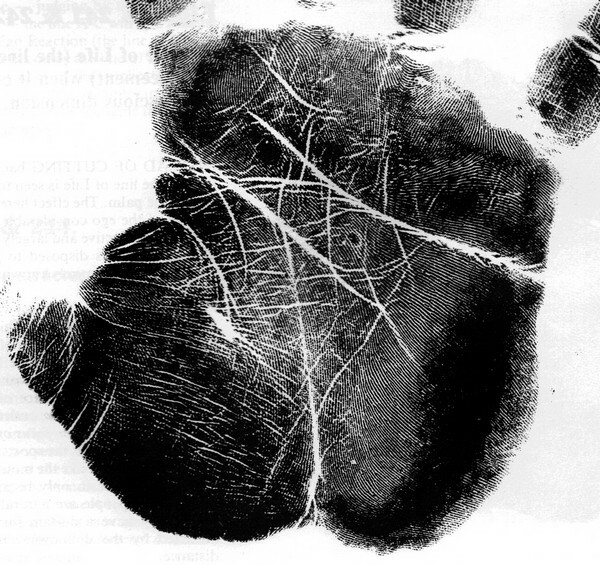 Especially since their approach also does not describe anything specific for hands with a short life line - so I am quite sure that such cases would simply become assessed as a 'single carpal base crease' (with only a fate line reaching out to the wrist) - but the same result is found for hands which have only a life line reaching out to the wrist! So, I have to conclude here that you're kind of trying to apply this 'carpal model' (designed only for assessing the zone of the palm just above the wrist)... to the central zone of the palm. Sorry Patti, but this does not make sense at all to me... I think you have misunderstood the purpose of that model. So would you please explain why you have tried to apply this model... while our discussion was so far kind of focused on the upper part of the fate line which is positioned in the CENTRAL zone of the palm? Thanks Patti, that is a fabulous post describing your rich experience! 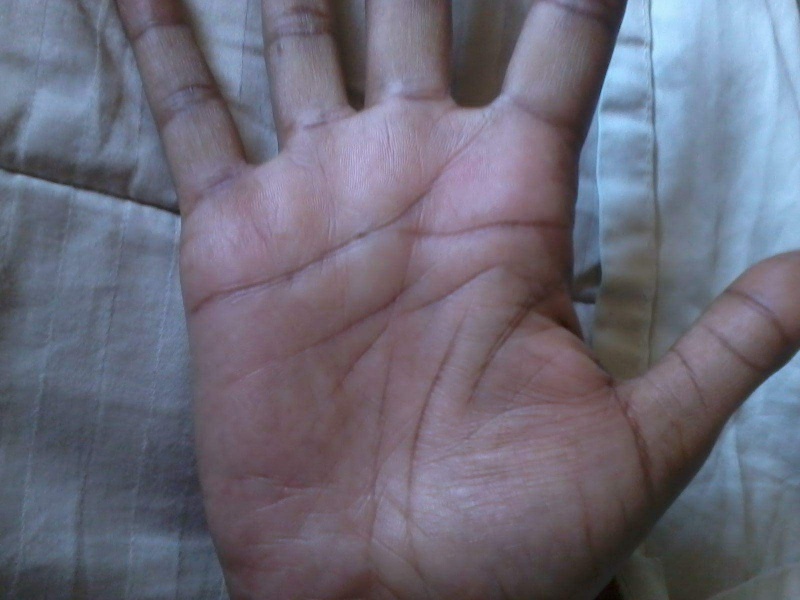 Since you don't think that what I presented from Schaumann & Alter and from Bali represent what is present in your aunt's hand, could you please present actual support for you stating the only longitudinal line, outlining the thenar area, is not considered in palmistry or biology a life line. I have fully supported my reason to state otherwise, but you have failed to give anything other than your viewpoint both in disagreement of my comments or to support your own. This is from "Trends in Dermatoglyphic Research" Durham & Plato. 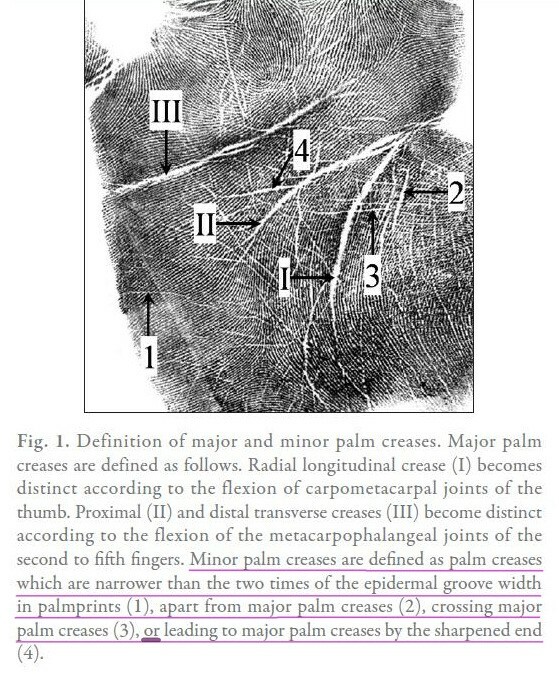 From the Korean's report "Improved Analysis of Palm Creases"
I did however, look at the report, and interestingly there is something that should be noted there. That is the Accessory Crease to (I), the life line. The percentage it is seen is much lower than a line of Mars, which is fairly common. Patti, I think example no. 176 in the Benham book of palmistry directly supports my assessment for my aunt's hand. Because example no. 176 describes the combination of a short life line + a fate line which ends at the head line... and to a certain level Benham's comments featured with that example make sense to me as well (though I would prefer to add explicitely that I do not support his ideas about 'timing'). I hope this is enough evidence? Patti, after I have presented the example from Benham's book I am not sure if there is anything left unclear about my position in this topic. By the way, please feel free to describe by detail (with a quote from my words) for which specific passages in my comments you would like me to present more substantial support. Because example no. 176 describes the combination of a short life line + a fate line which ends at the head line... and Benham's comments featured with that example make sense to me as well. I'm a bit surprised you chose Benham as your source for support in this particular topic as at the front of his book is a photo of a dead woman's hand with this in the caption "The Life Line shows a most remarkable confirmation of her death". So, I guess we can just pick and choose from what is agreeable and what isn't with regards to choice of expert resources. Aside from that, I notice that Benham also remarks "As a guide in all such cases (examples 176 and 177) remember that the Life line should enclose the Mount of Venus and not run on top of it." This is completely in line with Schaumann & Alter.